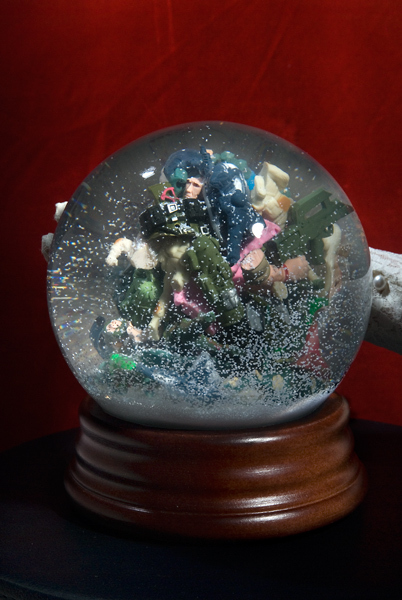 These clips are growing out of the Snow Globes and Candy Box series. The idea is to give the viewer a fuller experience of the actual objects themselves, to see the snow falling, and hear the sound of the music box tunes that some of the globes have installed. Re-Thinking Odysseus pushes the envelope a bit further. It plays on the story of Odysseus as he becomes trapped on Calypso's island. Most scholors give a Jungian explanation of Odysseus' need, after ten years of war, to re-connect with a feminine nurturing and non-aggressive energy. He yearns for this but also finds it suffocating and emasculating. This piece has an irreverent take on the archetypes of Warrior and Goddess, and asks why it is that peace, dating from our earliest roots, has always had to be considered boring, and the idea of adventure and masculinity always tied with going to battle. Please click on the images to see more, and use the back button to return to this page.